STUDY | Spend the week studying Philippians 4:10–20. Consult the commentary provided and any additional study tools to enhance your preparation. LANDING POINT | In Christ I have enough to be content in all circumstances. As Americans, we work long hours and sacrifice much in hopes of getting “just a little more.” Our country has been blessed with affluence. You would think that, with such abundance, we would be content. But look around you—do you see contentment? For many, “just a little more” simply isn’t enough. But Paul saw things differently. He learned to be content in all circumstances, whether he had an abundance of resources or precious few. How? Paul learned that whether he had little or much, he could always draw from his greatest resource—his relationship with Christ. The same can be true of you when you draw from Christ’s deep resources for you by faith, and trust in Him to provide for your every need. 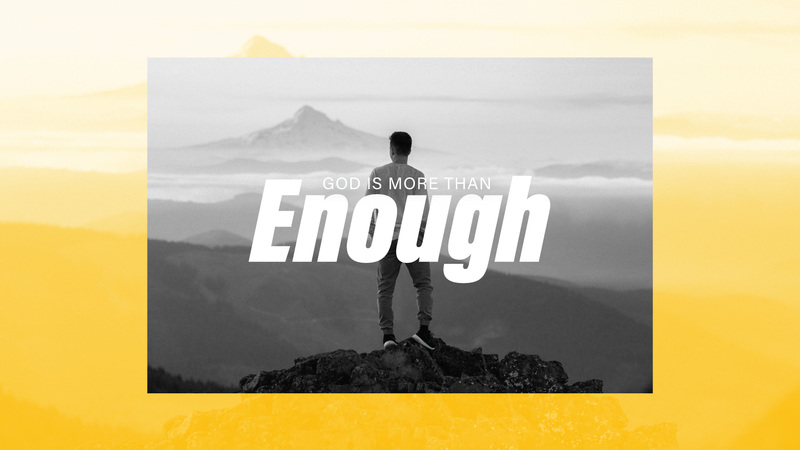 Christ wants to be enough for you. Q: Describe someone you know who lives a content life. What are they like? Q: What happens when you fail to draw from God’s resources for your life? Paul finished his letter to the Philippians by thanking them for sending gifts to supply his needs on the mission field. Paul rejoiced that these believers were concerned for him and were eager to help him. While Paul appreciated their generosity, he wanted to make something clear—he wasn’t in need. He knew how to be content in any circumstance. His contentment didn’t come from being self-sufficient; it came from his relationship with Christ and the strength He gave. Paul trusted Christ to sustain him in all circumstances, regardless of what he faced in life. Read: Philippians 4:10–20. De ne contentment in your own words. Q: Share about a time when you had a need and had to trust God to meet it. Paul highlighted how the Philippians were willing to share in his burdens as ministry partners. Time and again, they proved to be an example of extravagant givers, even if it was out of their poverty. Paul appreciated their gifts, but they were not his main concern. His main concern was that the gift would go towards ministry and the advancement of the gospel. Even so, Paul made sure to let these believers know that their gifts were a pleasing and acceptable sacrifice to God. Because they gave sacrificially, Paul promised that God would supply their every need. Q: What can prevent you from being a generous giver? What can encourage you to be generous giver? Q: Why is it important to understand the greater purpose your gift serves? Paul laid out a path to contentment. His focus wasn’t on what he had or didn’t have. His eyes were fixed on Christ, who would provide what Paul needed to do the work Christ had called him to do. Like Paul, God has prepared good works for you to do in your life (Ephesians 2:10). He has given you time, talents and resources to do them. Myth: It’s mine. I’ve earned it. Truth: Everything belongs to God. You’re just borrowing His stuff for the time being. Myth: If I only had a little more, I’d be happy. Truth: You’ll never be satisfied chasing after a little more. Your happiness doesn’t depend on what you have or achieve. Even the poorest man is rich beyond belief if he has Christ. Myth: Debt gives me freedom. Truth: Debt robs you of freedom. Avoid the kind of debt that makes you a slave to the lender (Proverbs 22:7b). Myth: When I have more, then I’ll be generous. Truth: When I’m generous, then I’ll have more. God rewards us for our generosity by meeting our needs. Q: Which of the above truths is most relevant to you right now? How can you replace the myth with the truth? The secret of contentment is to know and trust Christ, who gives strength in all circumstances. Paul could adapt to any situation and live in contentment because he had Christ. Since he had Christ, he didn’t have to be anxious or worry about his needs. He relied on Christ’s power to sustain him. He wasn’t self-suficient; he was dependent. You can follow Paul’s example. That may mean making hard decisions to live on less, get out of debt or forgo making upgrades to your home. Perhaps it’s attending the upcoming nine-week Financial Peace University course. Whatever it calls for, trust that in Christ you truly have enough, and depend on Him to meet your every need. Q: What are some practical ways you can follow Paul’s example in your life? Q: What does it mean to be fully dependent on Christ? What does it not mean? There really are magnificent benefits to being generous. When you give generously, you get two things from God: 1) His pleasure, and 2) His provision. First, you experience God’s pleasure because a generous heart pleases God. He is generous, and it delights the Father to see His children being generous, too. Second, you get His provision because God is trustworthy to meet all your needs. He has already met your greatest need in Christ—your salvation. If you can trust Him with that need, then you can trust Him to provide for all your needs, big or small. Q: Name one creative way you will give generously this week. The Bible says God loves a cheerful giver (2 Corinthians 9:7). Therefore, give generously and with joy in your heart. God’s gifts and provision are meant to be shared, not hoarded. Don’t worry when you start to feel the effects of giving away more than you think you can—a momentary dent in your finances is producing eternal fruit for God’s kingdom. Be willing to sacrifice to meet the needs of others. Live this way and expect to see God provide for you. Q: What would it look like to apply the above quote to your life? Q: Where do you need God’s provision most in your life right now? Thank God for His provision in your life. Pray for Him to make you dependent on Him and His provision. Ask Him to reveal people and places where you can give to share His love and help advance His kingdom. Read 2 Corinthians 9:6–15 and reflect on what this passage says about generosity. 1. Warren W. Wiersbe, The Bible Exposition Commentary, vol. 2 (Wheaton, IL: Victor Books, 1996), 98. 2. C.S. Lewis, Mere Christianity: A Revised and Amplified Edition, with a New Introduction, of the Three Books, Broadcast Talks, Christian Behaviour, and Beyond Personality (San Francisco: HarperOne, 2015), 86. 3. David E. Garland, “Philippians,” in The Expositor’s Bible Commentary: Ephesians–Philemon (Revised Edition), ed. Tremper Longman III, vol. 12 (Grand Rapids, MI: Zondervan, 2006), 258. 4. R. C. Sproul, ed., The Reformation Study Bible: English Standard Version (2015 Edition) (Orlando, FL: Reformation Trust, 2015), 2116. 5. Douglas J. Moo, “The Letters and Revelation,” in NIV Zondervan Study Bible: Built on the Truth of Scripture and Centered on the Gospel Message, ed. D. A.